The Elbridge T. Gerry mansion, designed by Richard Morris Hunt in 1891, sat on the southeast corner of Fifth Avenue and 61st Street. One of the most sumptuous residences in the city, it was the scene of some of New York's grandest entertainments. Louisa Gerry's annual ball, with a guest list of around 500, rivaled that of Caroline Astor's. Louisa died in 1920 and Elbridge in 1927. By then millionaires had abandoned Fifth Avenue below 59th Street and hotels and department stores had inched up towards what The Times deemed "the magnificent Gerry mansion." The house was shuttered for two years before Robert Livingstone Gerry leased the property to a group of wealthy investors, including Walter P. Chrysler, Otto H. Kahn, Finley J. Shepard, and K. G. Billings. On February 9, 1929, The New York Times announced, "The home of the late Commodore Elbridge T. Gerry at Fifth Avenue and Sixty-first Street will pass into the hands of wreckers in a few days. When the graceful chateau dwelling, rich in memories of another day, has been demolished, construction of a forty-story hotel will be started." Otto Kahn and Finley Shepard promised the hotel would be "characterized by its simplicity and refinement." The plot was increased by the purchase and demolition of several houses on 61st Street behind the Gerry mansion. The syndicate hired the architectural firm of Schultz & Weaver to design the combination residence and transient hotel. 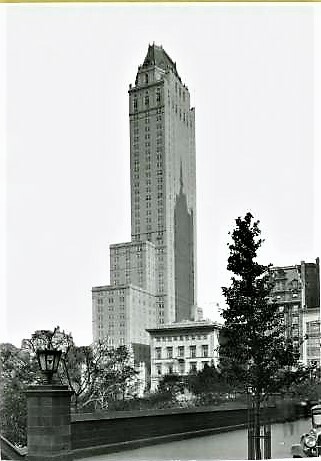 Their modern, high-rise take on Georgian architecture was designed to quietly coexist with the private mansions stretching up Fifth Avenue, and the elegant Metropolitan Club adjoining to the south. The Hotel Pierre was named for its president and manager, Charles Pierre Casalasco, who did not use his surname professionally. The Corsican restaurateur and chef had started his career in New York at the age of 25 as first assistant at the famous Sherry's Restaurant. Pierre had sold his restaurant on Park Avenue, reportedly disgusted with the deterioration of public deportment. An early postcard reveals the topmost floors, modeled after the Chapel of the palace of Versailles. Reportedly Charles Pierre directed that the last rivet in the copper-clad mansard be made of gold. The hotel was officially opened on the night of October 14, 1930. Charles Pierre hosted a dinner in the ballroom "for men prominent in business, financial and social lift of the city," according to The New York Times. Among the speakers was 85-year old Auguste Escoffier, known as the "father of French chefs." He lamented the fast pace of the Jazz Age, saying that "the feverish existence of modern times did not allow sufficient time for meals." Rising 41 floors and including suites with as many as 10 rooms, the hotel cost $15 million--in the neighborhood of $216 million today. Full-time residents could decorate to their tastes. The Times remarked "The suites are different in many respects and are furnished as guests prefer. 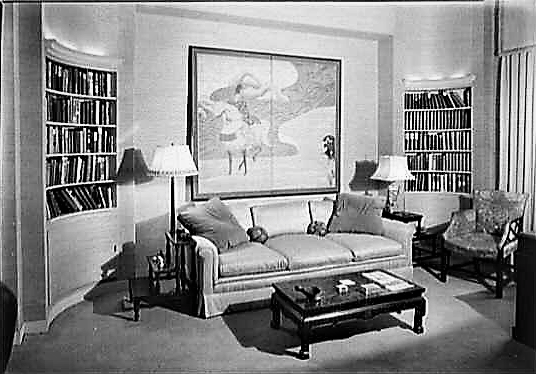 The walls are furred out to permit building in bookcases and corner cupboards." Residents' needs were answered through a "service signal service" that was wired through the central telephone board. The newspaper noted that "The early Georgian influence of the exterior is carried through the entire building, including lobbies, public rooms, suites and furnishings." In addition to the main dining room there were several private dining rooms, a basement grill room, and three ballrooms. An early advertisement boasted that the suites "were planned to approximate, as closely as possible, the rooms of a private home. Serving pantries in every suite." Despite the restrictions of Prohibition, the Pierre Roof on the 42nd floor provided elegant nightlife. The advertisement called it "New York's highest dining and dancing place. 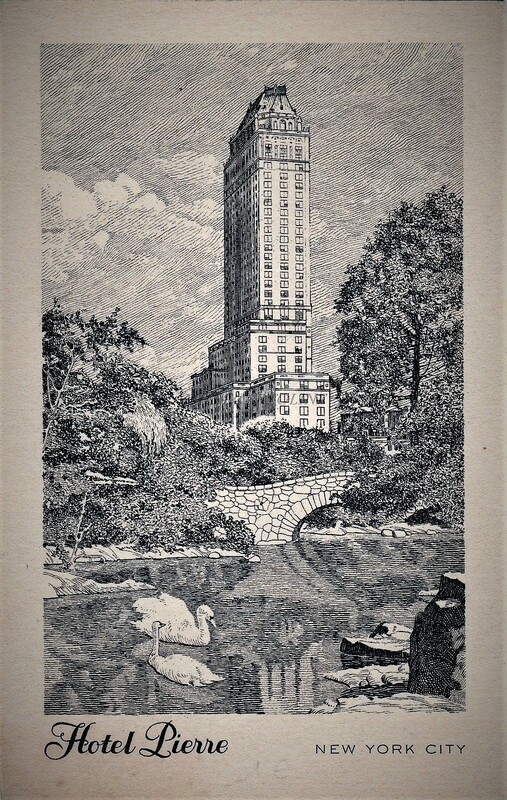 Not merely the elevation with its unsurpassed view, but the perfect ensemble of the Hotel Pierre service and cuisine, with the music of Jack Denny and his famous Orchestra." The Hotel Pierre's backers could not have chosen a worse time to embark on the expensive project. Although the hotel successfully attracted wealthy transient guests, the Great Depression took its toll. The anticipated number of permanent residents--crucial to the hotel's bottom line--did not materialize. Two years after its opening the Pierre declared bankruptcy. In 1938 the Hotel Pierre was offered for sale at the shockingly low price of $2.5 million--less than 20% of its assessed value. Paul Getty negotiated an even lower price, $2.35 million. He bought it not because he was interested in going into the hotel business; but because it was cheap. He later explained "I never understood why it was not snapped up long before I even heard that it was for sale." In the meantime, the ballrooms and dining rooms filled with gentlemen in white tie and women dripping pearls and diamonds as if there were no Depression. Beginning in 1931 Columbia University's annual formal ball was held here. On November 16, 1936 the Columbia Spectator reported that "more than 200 couples danced to the music of Irving Rose and His Hotel Pierre Orchestra." The event was financially successful, and the newspaper noted that "a profit of approximately $50 was realized." Among the permanent residents in 1938 was Babette Goldman, widow of banker Henry Goldman. Ironically, her sister-in-law, Louisa Sachs, also lived here. The two strong-willed women were not on the best of terms and at least once shared an uncomfortable elevator ride. Babette's granddaughter, June Breton Fisher, described the occasion in her 2010 book, When Money Was In Fashion. Louisa was dressed, she wrote, all in black, in mourning for her daughter. Babette, "by contrast, looked like a page of of Vogue, wearing a sable jacket over something gray and diaphanous, a John Fredericks hat, and her celebrated pearls. They exchanged cool nods and went their separate ways. A stranger might have assumed they had met once or twice at a fund-raising event or a tea, and would never have guessed that, in fact, they were sisters-in-law." Along with socialites and high-powered industrialists and bankers, celebrities were drawn to the Hotel Pierre. It was here in 1940 that the new Mr. and Mr. Desi Arnaz spent a honeymoon week. Over the decades stars like Elizabeth Taylor, Jane Fonda and her husband director Roger Vadim, and Ingrid Bergman would stay here. In 1953 Getty's friend, Frank Ryan, offered him $17.5 million for the Pierre; more than seven times what he had paid for it. Not surprisingly, Getty accepted. The Hotel Pierre was the venue of political events as well. Perhaps the first was the tense meeting held in a suite on March 27, 1946 between Russian Ambassador Andrei A. Gromyko, French Ambassador Henri Bonnet, and U.S. Secretary of State James F. Byrnes. The envoys attempted unsuccessfully to break the stalemate over Russia's refusal to relinquish occupied Iranian territories following World War II. On August 8, 1960 President John F. Kennedy met 30 Jewish leaders in the apartment of Abraham Feinberg. They laid out their dissatisfaction with the policies of the Eisenhower administration to the new president, and addressed Arab-Israeli issues. Just four years later Robert F. Kennedy announced the selection of I. M. Pei as the architect of the John F. Kennedy Memorial Library at Harvard University. Following Richard M. Nixon's election in 1968, he set up his interim office in the hotel. It was conveniently close to his 10-room Fifth Avenue apartment and, hard to believe today, he walked the block and a half to the Pierre every morning. It was here that he assembled his cabinet. The moneyed residents of the Hotel Pierre were unruffled by the presence of the president-elect. On December 4, 1968, syndicated columnist Tom Tiede wrote of one resident's reaction when a friend responded to her question "Who's that?" with "Richard Nixon." "'Oh, really,' the woman nods, buttoning the top of her fur-collared coat. She turns away, touches the back of her hair gently and tugs at her neat suede gloves. 'Well,' she asks, 'shall we go to lunch?'" The bellman explained to Tiede, "Well, you have to remember that everybody at the Pierre is used to seeing important people." He counted on his fingers Prince Philip, J. Paul, Getty, Baron von Rothchild, and pointed out that Aristotle Onassis had a permanent suite on a high floor. He concluded, "Naturally one has to be rich to live in the Pierre." Indeed, at the time suites could cost as much as $5,000 per month--about $34,500 today. The valet charge to have a suit pressed was $3 (almost $21 now) and a shave and haircut was more than twice that price. Tiede described the transient guests as "world travelers." "They sit in the lobby, these guests, chattering in many languages, dressed in diamonds and vicuna, waiting for cabs or companions. Aloof dignity." 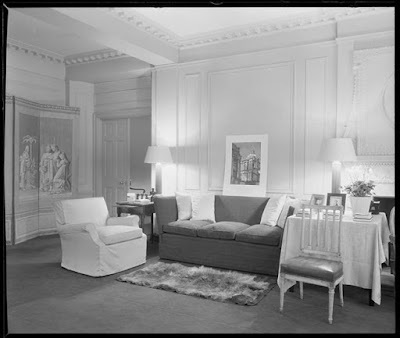 After the Nixons moved into the White House, Patricia Nixon maintained a suite at the Pierre. It was a convenient spot for meeting with her wardrobe designers. Dee Wedemeyer, writing in the Columbia Missourian on November 19, 1969 reported "Mrs. Nixon, who has said she 'hates to shop' has made an undisclosed number of trips to New York where the designers bring their clothes to her suite in the Hotel Pierre." Wedemeyer noted she "has kept American fashion designers busy creating a wardrobe for her worth about $19,000." Around 3:45 on the morning of January 2, 1972 a limousine pulled up to the Hotel Pierre. A small group of men entered, some wearing rubber noses and fake beards. They forced their way into the office and handcuffed and blindfolded the staff. The few unfortunate guests who happened through the lobby were also bound. For two hours the thieves worked on the safes containing guests' cash, jewelry and other valuables. The managed to crack open about half, making off with about $4 million--the largest jewel heist ever pulled off in the United States. On leaving they tripped the burglar alarm they had managed to avoid earlier. When police arrived they found 21 gagged and handcuffed people lying on the floor. Although the crooks were eventually arrested, more than $2 million of the stolen jewels were never recovered. The missing booty would be worth about $11.5 million today. World-famous political figures addressed dinners and conferences in the last quarter of the 20th century--among them Kurt Waldheim, George H. W. Bush, and Menachem Begin. One high-profile couple in the hotel were Johnny and Joanna Carson. When they split in 1984, he chose glitz over class and moved to the Trump Tower. Joanna assumed that Johnny would continue paying her $5,800 monthly rent in the Hotel Pierre. He assumed that the $2 million in cash and $44.600 a month temporary spousal support was sufficient. In December 1985 she filed papers pleading "I do not have sufficient current income...to pay the monthly rent and occupancy fees attributable to the Hotel Pierre Apartment." In 2005 the Pierre was acquired by Taj Hotels Resorts and Palaces of India. The subsequent Pierre Hotel Residences included the Presidential Suite which rented for $500,000 a month in 2014; and a three-story penthouse purchased by Wall Street mogul Martin Zweig. He put it on the market in 2013 with a $125 million price tag. The Fifth Avenue entrance speaks understated elegance. 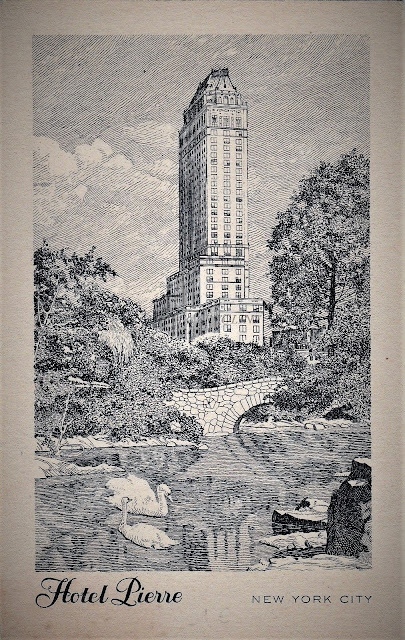 The perfect location of the Hotel Pierre across from Central Park and just north of the bustling Grand Army Plaza has ensured its upscale status nearly 90 years after its completion. Suites with as many as 10 rooms? Since that was bigger than most family homes, I wonder why anybody would sell up and move into The Hotel Pierre. Or not sell up, possibly. House-sized apartments were not uncommon; although they were beginning to disappear by the time the Pierre was constructed. The largest New York apartments at the turn of the century could be 15 to 20 rooms.